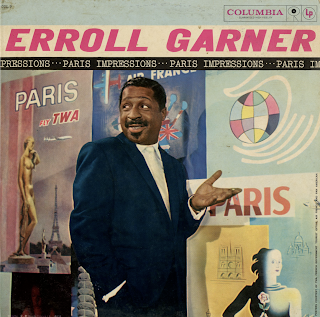 Jacket notes: On December 1, 1957, Erroll Garner made his first trip to Europe in almost ten years. He spent all of this sojourn in Paris, with a few days away for concerts in Nancy, Brussels, and Amsterdam, and a flying visit to London. In Paris, during his spare hours between performances at a leading theatre, Garner spent his time as a tourist – absorbing the sights and sounds everywhere. He walked over the city in the crisp winter weather. The hospitality of the French people, the beauties of the landscape, the tempo, the personalities he met, the music, the graphic and performing arts – all these left their impressions on Garner; and Erroll, in turn, produced an outpouring of music in his daily theater performances which won him critical accolades and many new friends. His audiences encompassed all strata of French music lovers. Among the several honors he received while in Paris was the coveted Grand Prix du Disque, which was presented to him by Darius Milhaud at a luncheon of the French Academy of Arts. Upon his return to the States Erroll Garner talked very little about his trip. He seemed to be absorbing the essence of his experiences. In late March, Garner asked Mitch Miller to schedule a recording date, so that he could "... record my trip to Paris." Hence, these albums, which showcase an eloquently articulated gallery by Garner. He plays some Paris-associated songs, and has composed some selections to round out his portrait of Paris. In addition, Columbia is fortunate in being able to include a camera view by photographer Aram Avakian, who was Garner's aide-de-camp on the trip. Garner has taken his observations and experiences there and fashioned them into a tribute to the French people. 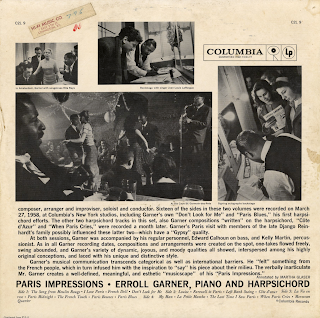 Permeated by the creative spirit which marks Paris, Garner tops his "Paris Impressions" collection with some work in new medium; namely, the harpsichord. This set features Garner's debut as a harpsichordist with some provocative results. In his never-ending search for new sounds, for fuller expression of his ideas, for an orchestral quality, Garner – already acclaimed throughout the world as the outstanding contemporary pianist to emerge from the jazz genre – has trapped still another facet of his versatile artistry. Although Mitch Miller long had suggested that Garner perform on the harpsichord, the pianist didn't essay it until he returned from his French trip. During a 12 month (1957-58) period during which he stepped up his concert schedule, made his debut with orchestra and gave increasing time to his work as a composer and arranger, Garner took this step on harpsichord – one which "kicked" him termendously, and one which he hopes will be stimulating to his listeners. Thus, in this one-man collection, Garner appears in two media – piano and harpsichord; he functions as performer and composer, arranger and improviser, soloist and conductor. Sixteen of the sides in these two volumes were recorded on March 27, 1958, at Columbia's New York studios, including Garner's own "Don't Look For Me" and "Paris Blues," his first harpsichord efforts. The other two harpsichord tracks in this set, also Garner compositions "written" on the harpsichord, "Cote d'Azur" and "When Paris Cries," were recorded a month later. Garner's Paris visit with members of the late Django Reinhardt's family possibly influenced these latter two – which have a "Gypsy" quality.